Home > Projects > Why barrel & screw made from martensitic stainless steel? Why barrel & screw made from martensitic stainless steel? In all of the Stainless Steel, for our experience, the hardness will be highest after quenching, it is the 440 series of Martensitic Stainless Steel, from the sheet below we can learn, such as the 440C (Chinese corresponding grades is 9Cr18, 9Cr18Mo, 11Cr17), and the 440F (Chinese corresponding grade is Y11Cr17), after quenching, its hardness even will be up to 60~62HRC. If we want to obtain higher hardness and better wear resistance on stainless steel surface, more way is an ion or gas nitriding process after quenching, but a sorbite condition has to be got. From below sheet [Quenching temperature of Martensitic Stainless Steel, Destressing Temperature and Final Hardness], we can witness our experience above. For a food and a drug extruder, the normal raw material is in powder solid or in granular solid, compared with ordinary polymer material, the cutting wear and the matching wear is more serious. And because these is a certain amount of water inside the material normally, and even some salts inside, the screw and barrel now in an alkaline corrosion condition. So that the barrel and screw of a food and a drug extruder needs to not only a wear resistance, but also a corrosion resistance, the martensitic stainless steel with both corrosion resistance and high hardness, becomes our first material choice. 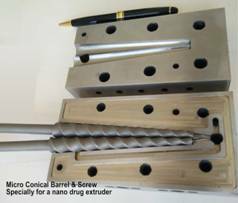 Right picture is a set of Micro conical barrel & screw made by us, which specially used in a nano drug extruder, made from 440C stainless steel. An overseas company ever used M2 barrel and screw, but its service life is only 1/2 of 440C stainless steel.